Thanksgiving is important for many reasons, and it must be celebrated properly. It’s a holiday that is all about counting our blessings and sharing a meal with loved ones. It is not about presents. Thanksgiving is a time when friends and family are assembled. Thanksgiving means family is in town and spices are in the air. There are pies. Potatoes. Yams. Football on TV. A good old family discussion about politics or religion. Thanksgiving is a time to make memories, to embrace traditions, both old and new, and to celebrate our families, both the ones we are born into and/or the ones we choose. The day after Thanksgiving is the day I start acknowledging Christmas exists. Not before. In the past, it also meant Black Friday, but since I’m not in the market for a new TV or new running shoes, there’s nothing I really want to buy on Black Friday anymore. This year, to celebrate Thanksgiving, the mighty awesome Wolfpack (i.e., Chris, David, Sean, Matt, and myself) has decided to do a #WolfpackThanksgiving — with the hashtag, because that’s how we roll. Nothing complicated: we post a recipe Thanksgiving-related recipe on our blogs, assemble to go for a turkey hunt, and then howl at the moon until we’ll be all howled out. 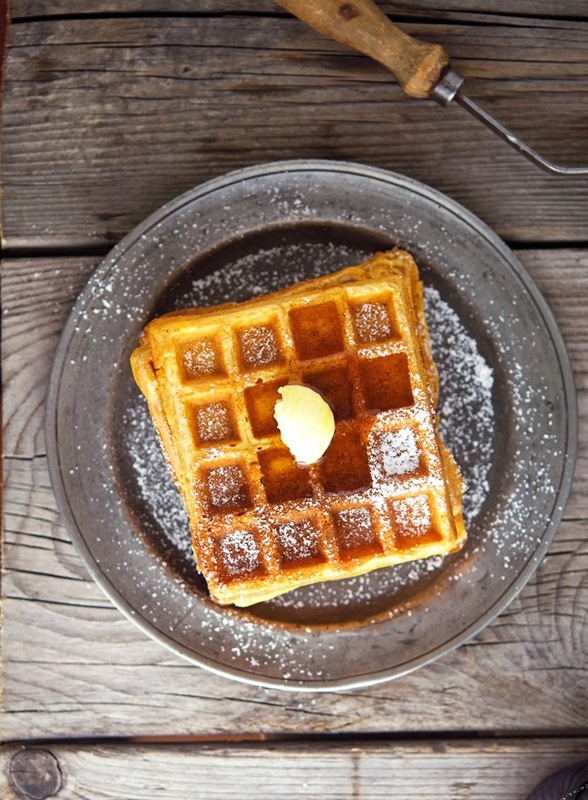 Just a couple of things about these Sweet Potato Pie Waffles. They’re not overly sweet though. I like to eat mine with butter and maple syrup for breakfast, but they’re great also with ham & cheese, or avocado and egg, or even bresaola and shaved Parmesan cheese for a savory snack/lunch. They’re super versatile. They also freeze very well once baked. Just put them in the toaster or in the oven for a couple of minutes and you’ve got yourself some piping hot, delicious waffles. I’ve tried making them with coconut flour and almond flour. But I was very disappointed with the results. They never came out crispy as I’d hoped; and waffles need to be crispy, it’s a must. So I settled to use Bob’s Red Mill gluten-free flour; it’s not 100% paleo approved but what the hell, it’s Thanksgiving after all. 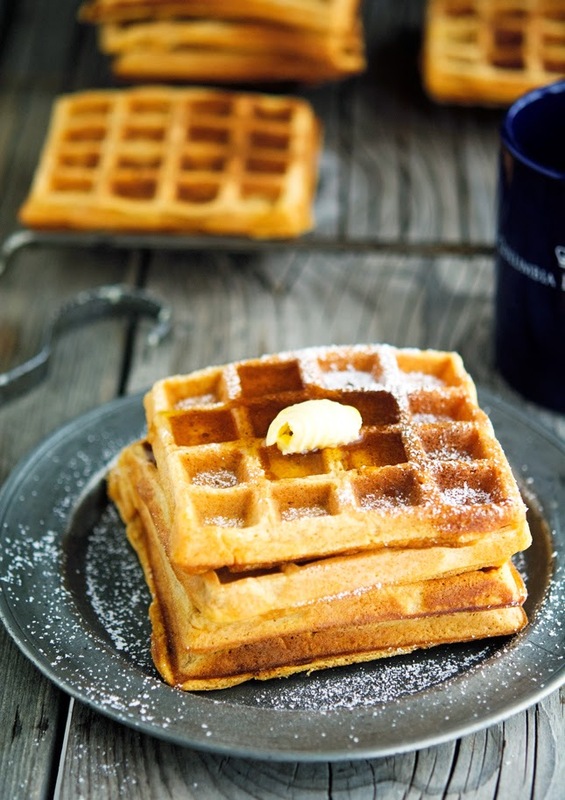 Sweet Potato Pie Waffles (Low Carb & Gluten-Free) Print this recipe! *You can sub it with whole wheat flour, if you’re not afraid of gluten. 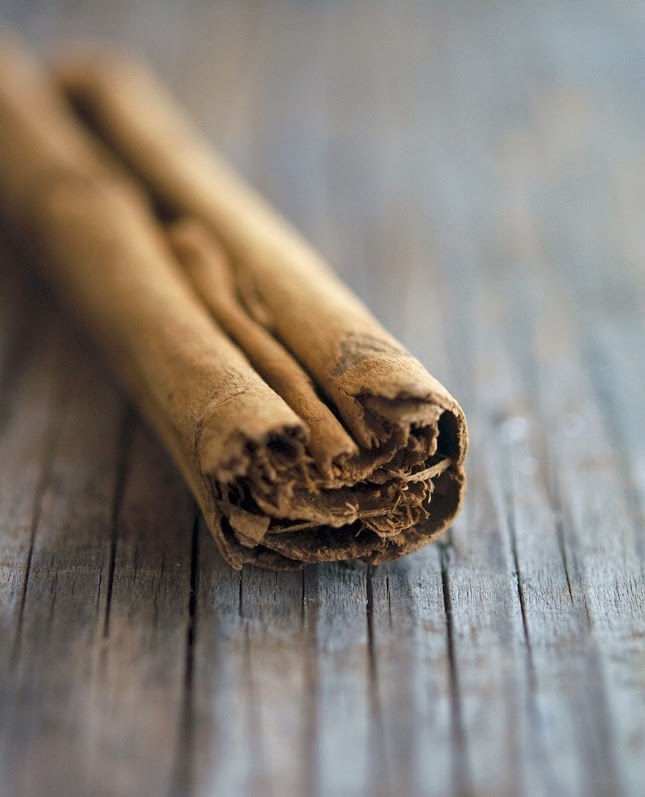 **If you can’t find coconut sugar, you can use brown sugar such as Muscovado. Sift together flour, baking powder, baking soda, salt, sugar, and spices in a bowl. Set aside. In a separate bowl, whisk together egg yolks, mashed sweet potato, milk, maple syrup, and vanilla extract until smooth. Pour over the dry ingredients and very gently stir until halfway combined. Pour in the melted butter (or coconut oil) and continue mixing very gently until combined. In a large bowl with an electric mixer fitted with whisk attachment (or in the bowl of a heavy-duty mixer), whip egg whites with a pinch of salt, starting on low, increasing incrementally to medium speed until soft peaks forms, about to 4 to 5 minutes. Scoop the batter into your waffle iron (spray waffle iron if it isn't already nonstick) in batches and cook according to its directions. Serve warm with pure maple syrup and softened butter (or whipped cream). The waffles also freeze very well once baked. 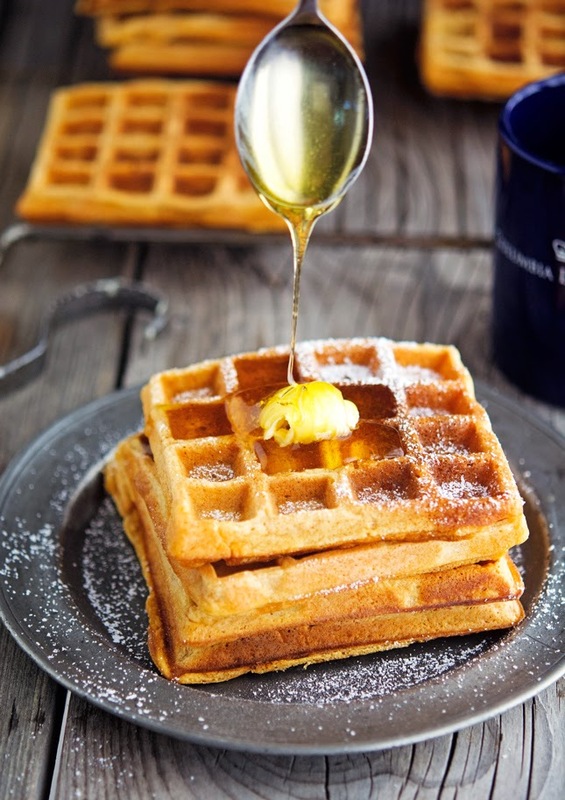 One waffles yields 127 calories, 6 grams of fat, 18 grams of carbs, and 3 grams of protein. My mind is blown. I was just stretching out my vocal cords for my nightly howl, and I noticed these waffles. I think I need them in my life. And the idea of using them as a sandwich? Perhaps with some leftover turkey and stuffing? I need that in my life, too. Nice work, Alpha, nice work! #WolfpackThanksgiving P.S. I totally laughed out loud at the 'family discussion about religion or politics'...it wouldn't be a holiday without it, right?? Holidays in my family are all about discussions on politics and religions, it's a staple! These look beyond amazing! I see an addiction coming in the near future! OMG, decorating for Christmas on Thanksgiving has to be the worst, the worst of the worst! We shall meet at the Leaping Rock. OK? ..Turkey hunting and howling at the moon...now I see how y'all got y'alls #! These waffles sound sik Mike - perfect crispness is a much needed trait in waffles these days! We're cool Shashi, just like that! You seriously crack me up, Mike. These waffles are not only genius, but absolutely LEGIT. The perfect day after Thanksgiving breakfast. Dude, you saying that my waffles are "legit" is golden. Thanks! Oh my gah... These waffles... as a sandwich?! You're slaying me! I need some more #WolfPackEats in my life! Waffle sandwich is the new thing Bec, you should totally try it! I completely agree with no Christmas anything before Thanksgiving! Each holiday need its own special attention. 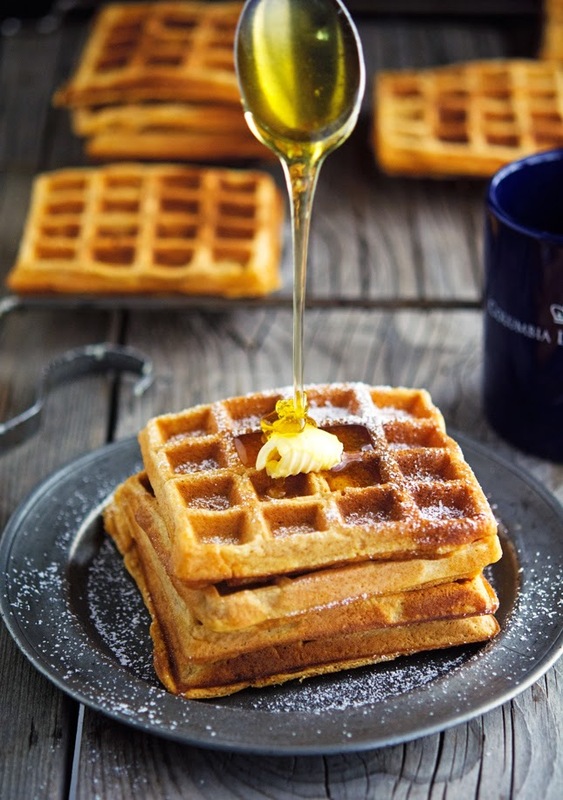 These waffles sound amazing. I love to make either healthy pancakes or waffles on the weekend with enough to freeze and enjoy mid week. Looking forward to trying this out! Awesome Linda, if you do try 'em please report back! Just arrived back in Australia and literally saw my cheapo waffle maker lying solely in the corner. Thanks alot. It needs to be used today now. I'm also envious of all your thanksgiving goodness coming up. DAMN AUSTRALIA. You can celebrate Thanksgiving in Australia as well Arman. Just invite your family and a couple of friends over for dinner next Friday, and serve some turkey, cranberry sauce, mashed potatoes, sweet potato pie and stuffing. That's it, you've got yourself a true American Thanksgiving! Given the recipe for these waffles to my partner so I can wake up to a plate tomorrow morning - they look beyond delicious Mike! Nice waffles Mike, I love Christmas but I'm with you about waiting till after Thanksgiving! Mike you are the best! I´m always waiting for your new receipes. Thanks for sharing. I totally agree, first Thanksgiving, then Christmas. I enjoy the Advent celebration here in Germany. I love everything with sweet potatoes, the waffles look great. The wolfpack thing is cracking me up. You guys are awesome. Pinning away here because I am totally making these when our guest are here for the holiday. Love that you gentlemen all formed a wolfpack! I've been making pumpkin pancakes a lot lately, so I think that sweet potato waffles are a natural progression for me. YUM. Lots of laughs and lively discussions with religion or politics are always part of a family holiday around our house. Saw these waffles this morning on Instagram - should temper anybody though... saweeeet! And I agree, no Christmas until AFTER the Thanksgiving please. It's the spirit of the holidays and not the marketing and money. These are FANTASTIC! Usually half a waffle with yogurt is enough for me on Friday mornings (my extra-long run mornings) but these were so good I had a whole waffle! Thank you for sharing the amazing-ness! An added bonus: my kitchen smelled divine while these were in the waffle iron!